The Department of Facilities continuously accelerates its efforts as an environmental steward, striving to build and maintain high-performance, sustainable buildings that meet the needs of our community while also reducing waste, conserving resources, and taking advantage of efficient on-campus power. Issues of sustainability, energy, and carbon footprint are addressed in every substantial project conducted by Facilities, from new construction to renovations and maintenance. The sustainability measures we undertake range from steam trap replacements and more efficient lighting to the incorporation of whole building automation. Each measure helps us reduce overall energy consumption, which is tracked on an annual basis. For existing buildings, MIT’s proactive Capital Renewal program is engaged in continuous renewal and renovation projects that promote energy efficiency while ensuring that the campus will support the community’s broad spectrum of educational, research, and student life activities. Among the Institute’s environmental goals for capital projects is to include an integrated design process at the outset of the planning process to incorporate the desires of architects, engineers, and MIT in an effort to achieve an efficient building. 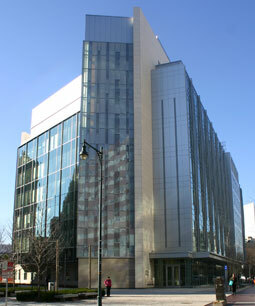 The Sloan School project was the first to use the Integrated Design Process. In the typical design process, work is linear, so that each discipline works one after the other. The integrated process includes all of the architects and engineers from the beginning, so that they can more effectively work as a team.